Keeping a "visible" register of my polishes: I've been doing that since 2000 (I'm an old lacquerhead :-P), when wheels where somehow an insiders' product (at least here in Italy), and I used to swatch them on fake nails - some of them with an embarassing "stiletto" shape - a sort of Zoya spoons forerunners. I still have them, to remember some nice polishes I got rid of :-( (dammit thinners were not known/available here and I refused to drip acetone into polish) and some awful ones I hope I didn't wore very often. But now (with the help of Ebay) I have wheels, perfect to group colors and keep evidence of how they are IRL. Here is the first one I completed since I started blogging; I know I should have separated lilacs and fuchsias, but at that time I didn't expected my collection to become so large I could be more specific. E' parecchio tempo (dal 2000) che tengo un elenco dei miei smalti, con tanto di campione (che fare, la mia è una fissazione); dato che le ruote ai tempi erano prodotti da professioniste, mi limitavo ad usare delle unghie finte – alcune con sagome appuntite agghiaccianti - come supporto (molto prima degli Zoya spoons). Ovviamente le ho ancora (sono parecchie), come ricordo di certi smalti stupendi che purtroppo ho buttato (e chi sapeva dell'esistenza di thinner appositi, dannazione, mi son sempre rifiutata di allungare gli smalti con l'acetone) e di certi altri orrendi che spero di aver messo poco. Purple Wheel #1, two coats of each color: I linked my swatch, if existing (some from my "first steps" into blogging, I'm quite ashamed of them, maybe in the future I will reswatch those poor polishes). 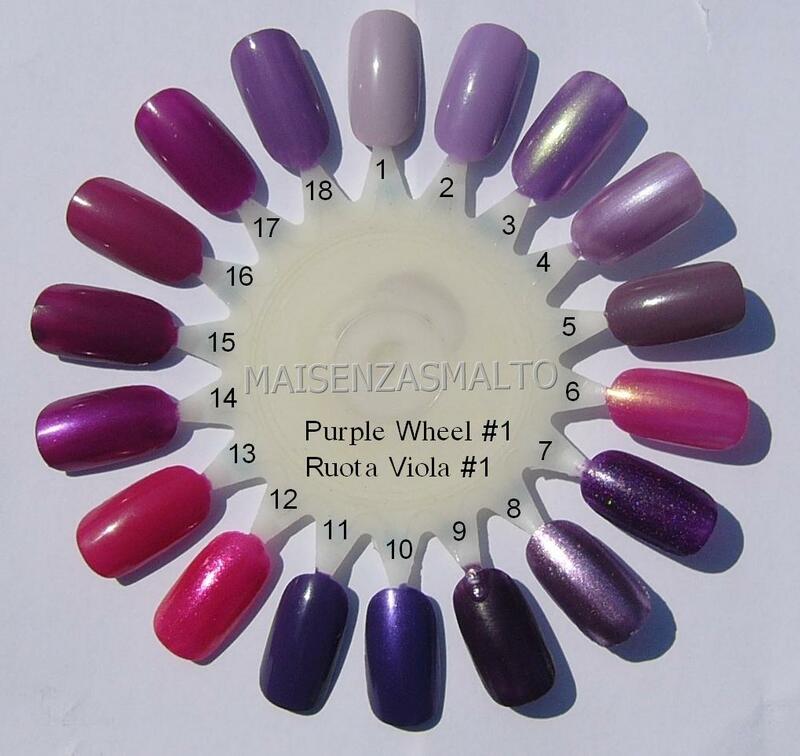 Ruota Viola #1, due mani per ogni colore: linkato lo swatch, se c'è (alcuni sono tra i primi del blog, una vergogna, chissà se prima o poi avrò tempo per rifarli).